Though I’ve been on vacation, the past few weeks in Chicago have been HOT lately. Okay, maybe not that hot but being born in Canada, I feel like I’m pretty engineered and bred for the cold so any heat feels like a lot to me. That’s why these delicious and healthy treats are perfect for summer. 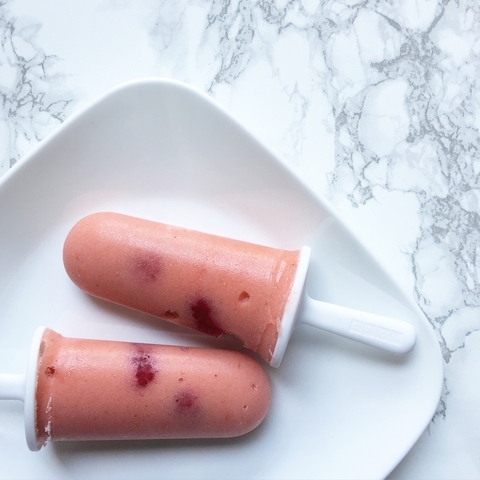 Click read more below to see the recipe made super simply by using popsicle molds! A quick, healthy summer treat to cool down in the heat! Pour pineapple juice, unsweetened vanilla almond milk, and frozen strawberries into a blender. I use a Ninja one. Blend for at least a minute or until ingredients are completely blended. Stick a few fresh raspberries down into the mix. Put popsicle molds into freezer. Let freeze for at least one hour before eating. P.S. My mom got me my popsicle mold from Bed, Bath & Beyond but the brand Zoku, is sold as a few different places. You can buy your own right here for only $14.99! Those look way too delicious! What a perfect summer treat! Love these! Sound SO refreshing!